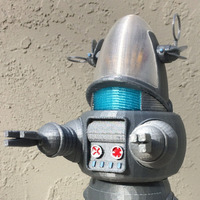 Summary This is a ~1:9 scale model of Robby the Robot, who originally appeared in the 1956 science fiction film "Forbidden Planet". He later appeared in many other films and TV shows. 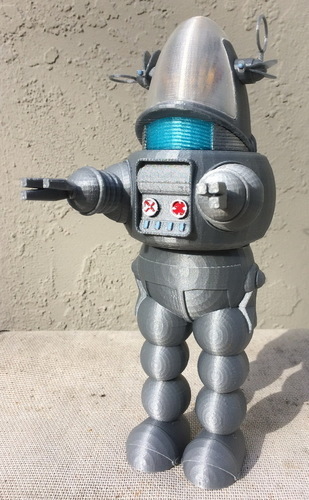 See this link for more information: https://en.wikipedia.org/wiki/Robby_the_Robot The model is close to 240mm (9.5") tall when assembled. 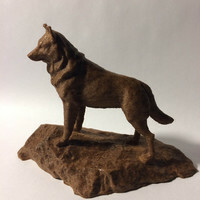 Glue is required to assembly it, and a bit of paint to add a few details is recommended. 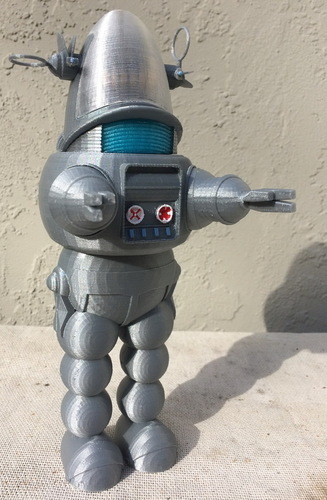 I did not create this model, but it has been floating around the internet for several years, and I decided to modify it to make it into a 3D-printable kit. 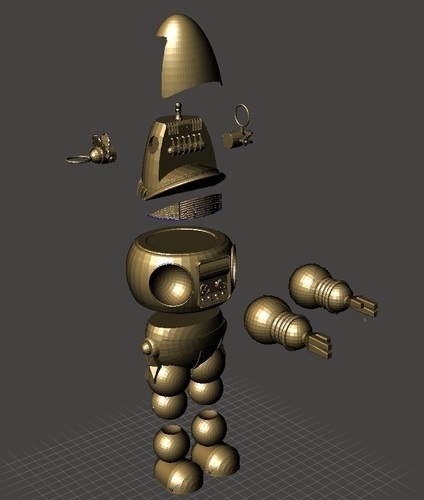 I used the OBJ mesh available from Foundation 3D uploaded by Starbase1, available here: http://www.foundation3d.com/index.php?categoryid=38&p13_sectionid=1&p13_fileid=1792 The arms can be pressed into the sockets so that you can change the pose, so I don't recommend gluing the arms. I used a translucent blue PLA for the "voice light" and clear PLA for the dome. 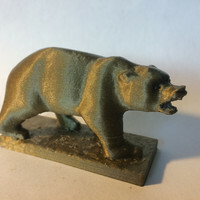 The rest of the model was done in silver metallic PLA. 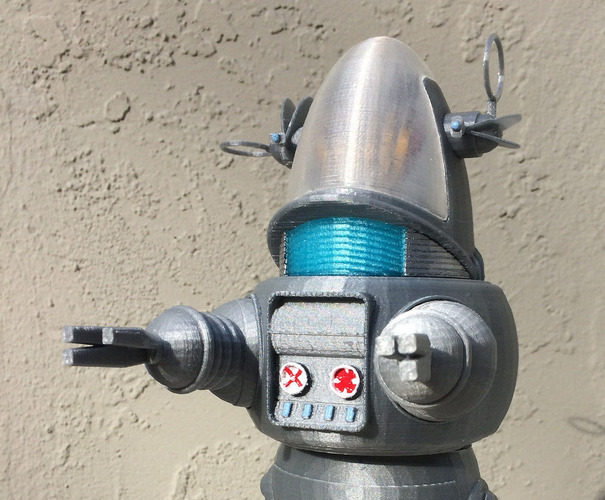 The actual robot is a darker metallic color, so you may want to consider that if you build it. 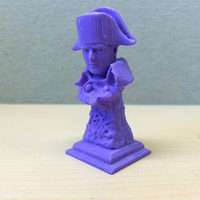 Print Settings Printer Brand: Ultimaker Printer: Ultimaker Original Rafts: No Supports: Yes Resolution: 0.15 mm or better Infill: 10% Notes: The parts in the .STL files have been pre-oriented for best printing and minimum support. 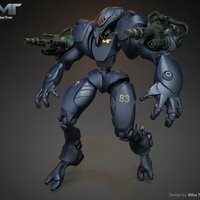 How I Designed This I used MeshMixer to break the model into parts, simplify some of the features and turn them into solid parts ready for printing.